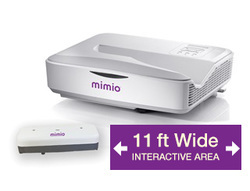 Brings collaborative, 10-touch interactivity* to classrooms, with images as wide as 11 feet! Easily work on the large, touch-enabled, interactive area individually or in small groups. Saves time and resources. There’s no lamp to fail, no lamp to change. And there’s a 20-year laser life span. A full-featured hardware and software solution. Comes with award-winning MimioStudio™ classroom software and the MimioMobile™ app. Software and app enable collaboration and assessment either at the front of room or on almost any student device. Laser projection means no bulbs to change — ever. Runs on Mac, Windows, and Linux. Ethernet LAN connectivity, for central management and control.